Exmouth is a town on the tip of the North West Cape in Western Australia. 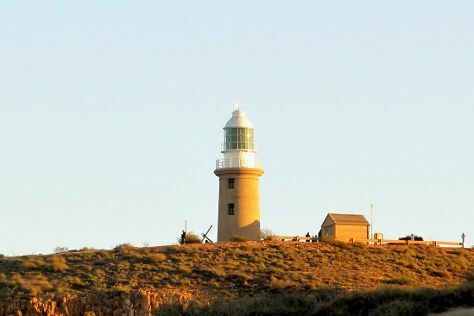 Your inner history buff will appreciate Vlamingh Head Lighthouse and Potshot Memorial. Do some cultural sightseeing at Ningaloo Centre and The Ningaloo Gallery. Spend the 16th (Wed) exploring nature at Mandu Mandu Gorge. There's much more to do: enjoy the sand and surf at Turquoise Bay, see the vivid underwater world at Ningaloo Coast World Heritage Area, look for all kinds of wild species at Ningaloo Reef, and find your balance on the water with some of the best stand-up paddleboarding in the area. To see other places to visit, ratings, maps, and other tourist information, read our Exmouth trip website . In October, plan for daily highs up to 39°C, and evening lows to 19°C. On the 24th (Thu), you're off tohome.